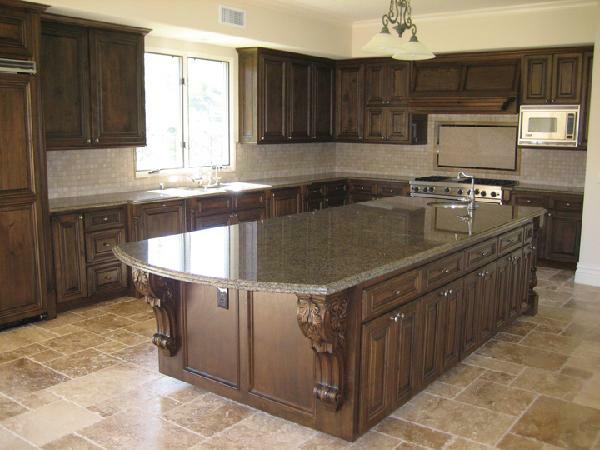 Welcome to our gallery featuring Tropical Brown granite kitchen countertops design ideas. The combination of dark brown and black crystals create a uniform color with a rich looking stone. 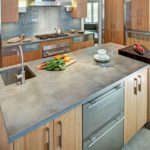 If you are planing to put brown countertops in the kitchen this stone would be a perfect fit for that. 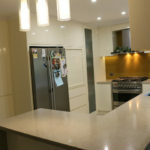 For cabinets choice, we recommend definitely with white cabinet but there is always exceptions. 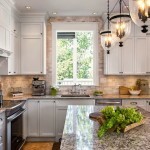 Backsplash ideas, creamy natural tile stones are preferable. 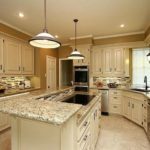 For flooring, it does not matter the color choice of cabinet but floor should be chosen mostly dark color materials. 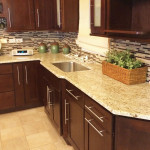 What color of the cabinets goes well with Tropical Brown granite countertop? This is the one of main dilemma among the home owners. 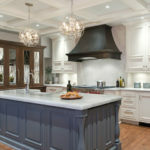 However, my answer is mostly white cabinets with dark glazed would be perfect. 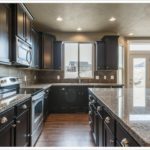 Dark cabinets are nice too but mainly white or cream cabinets are more desirable. 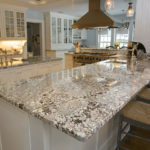 Second important question would be the backsplash selections. 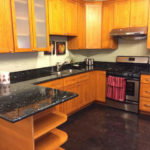 What color or type backsplash goes well with this countertop? On the other hand, well first indication should be a cabinet color. 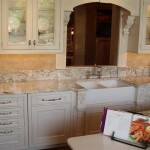 According to the cabinet selection(looks like mostly white) we need to make a decision for the countertops. 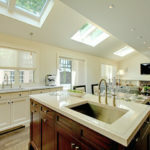 Finally, the cost of the Tropical Brown installation price is $45 per square foot. 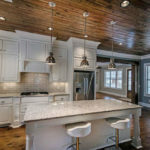 Lovely color combination covered all around the kitchen. 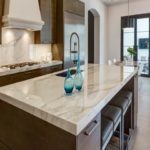 Besides, Tropical Brown countertops with cream color cabinets completed travertine backsplash and nice accent colorful mosaics. 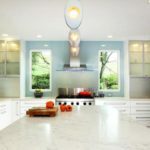 L shaped kitchen designed also with multi coloring concept. 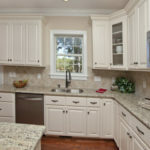 White cabinets combined with Tropical Brown tops. 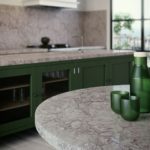 Green/brown mixed subway style backsplash coordinates with countertops and wall paints. On the other hand, cherry stained dark hardwood floor continues to living room to give some more contrast to the that direction. 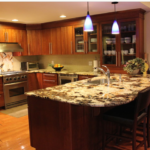 Lovely kitchen with white cabinets combined Tropical Brown to create tremendous nice contrast. 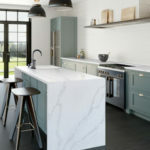 Especially, it creates amazing contrast with white cabinets. 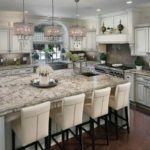 Stunning kitchen with white cabinets and Tropical Brown granite countertops look good if you are planing white cabinets dark stones combination. 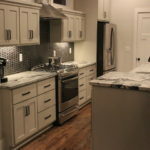 For instance, creamy looking backsplash and dark floor color completed the designing. 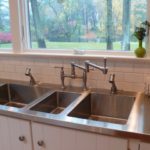 Stainless steel appliances and bar stools create cozy environment. 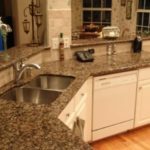 One of the Tropical Brown granite kitchen countertops granite design ideas is to use with dark cabinet combinations. 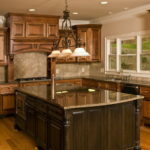 Moreover, dark color floor tiles added also nice touch to the kitchen remodeling ideas.